Columbine, Aquilegia spp. are a shady favorite. Few flowers signal spring quite so singularly as columbines. Their nodding flowers and spacious foliage look light and graceful wherever you plant them. Hummingbirds are regular visitors to the flowers. Columbines grow best in partial shade or light shade. They prefer soil that is fertile, moist and well drained, but adapt well to most soil conditions. Do not overwater. Division is not required but can be done to propagate desirable plants. The divided plants may take a while to recover because columbines dislike having their roots disturbed. Use columbines in well-drained shade gardens, formal or casual borders and naturalized or woodland gardens. Most of the large-flowered hybrids are not well-suited to Texas heat and soils. A. canadensis (wild columbine, Canada columbine) is a native plant that is common in woodlands and fields. It bears yellow flowers with red spurs. A. chrysantha var. 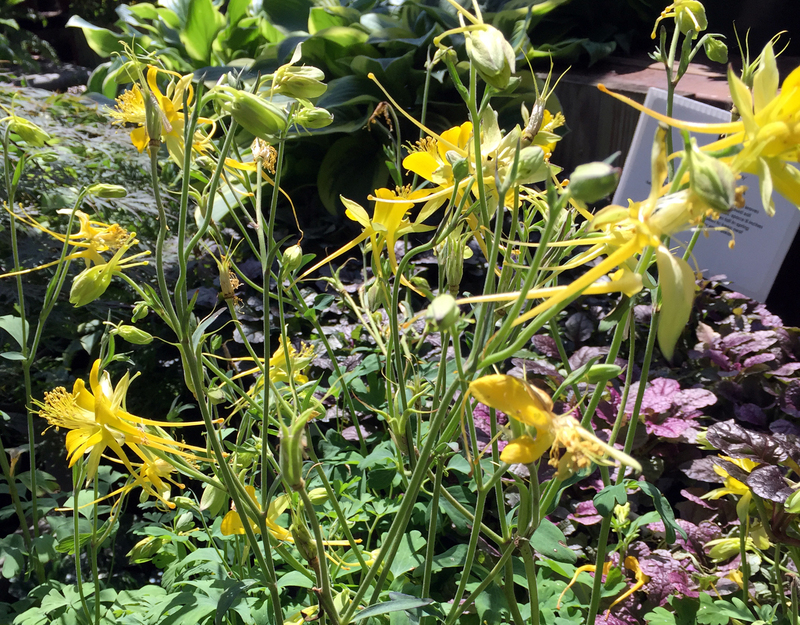 hinckleyana (Hinckley’s golden columbine) grows 18–24" tall and 24–36" wide. It bears large, bright yellow flowers and blue-green foliage. It is a Texas Superstar® plant. A. vulgaris (European columbine, common columbine) has been used to develop many hybrids and cultivars with flowers in a variety of colors. Note: Columbines self-seed but are not invasive. The new seedlings are often a different color than the parent plants. Blame it on the bees.